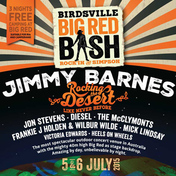 Coming out to Birdsville is a special thing, but coming out with Jon and Diesel makes it even more fun. It’s a place that I’ve never been to before – and I’ve been to most places in Australia. So really looking forward to getting there – we’re going to rock and everybody on the bill are friends, so look out we don’t know what’s going to happen. See you at The Bash!